RiverRun International Film Festivalon April 13th and April 14th, 2019. Please join us and celebrate the premiere and first screenings of F/11 in our home state of NC! We will be doing a standing Q&A following these screenings. Specific venues and times will be sent to you in a followup email. We are pleased to announce that the World Premiere of F/11 and Be There will take place at the 25th Annual Austin Film Festival in Austin, Texas from October 25, through November 1st, 2018. F/11 and Be There will be in competition for the category of Documentary Feature. We are so delighted to be premiering F/11 in competition, among such prestigious company, and we want to sincerely thank each of you for participating in this journey along with us. The man himself, Burk Uzzle, will be in attendance for both of these screenings; there will be Q&A after each. In the event that you'll be in Austin around that time and would like to come to a screening, or just to stop in and give Burk a high-five, please let us know. We have been tremendously fortunate in working with some incredible people through the course of making this film, and that especially applies to Natalie Prass and Eric Slick. Their score, which they composed and performed, is a score like no other. We are very proud to have these ultra talented musicians in the film. We'd like to express a long overdue, most heartfelt thanks, to Beverly Brannan at the Library of Congress, for all her hard work helping F/11 with access to some of Burk's archive. Also a huge thank you is due to Mustapha Kahn, for being a most excellent consulting producer on the film, and for granting us access to a private theater room for screen tests. Many thanks to Graham Leader for you friendship, and for being forever generous in extending your vast expertise to us throughout the process of making this film. And thank you Tom Chandler for being a champion in so many regards. Many more thanks to come as F/11 makes its way out into the world. We would like to give very heartfelt thanks to William R. Ferris, who selected the F/11 companion short film "Remains" to screen in a traveling museum exhibition on Civil Rights photography. The exhibition will travel to Montpellier, France - Johannesburg, South Africa - as well as The Smithsonian: The National Museum for African American History and Culture in Washington, DC. We are absolutely honored to be included in such a prestigious exhibition. The exhibition begins Oct. 17th, 2018 at the Pavillon Populaire in Montpellier, France. William R. Ferris, a widely recognized leader in Southern studies, African American music and folklore, is the Joel R. Williamson Eminent Professor of History Emeritus at the University of North Carolina at Chapel Hill and the senior associate director emeritus of its Center for the Study of the American South. He has written or edited 10 books and created 15 documentary films. F/11 and Be There was recently early accepted to two very significant film festivals and we are super grateful and excited to share this news with you all. We are still meeting with advisers about festivals and once we have decided on the most appropriate course for the U.S. Premiere, you'll get an update with all that information, as far as location, dates, and all the rest. Thank you for hanging in there with us, and we are so pleased to be able to show you F/11 soon. Early this month, Burk and I were granted access to the confederate monument toppled by protesters in Durham, NC in 2017. This month is the one year anniversary of that event. What Burk has to say about the New / Old South and Southern identity in 2018 is truly important to hear. We decided to make a 5 minute short film of Burk photographing the monument as it is now, as a companion piece to F/11 and Be There. If you feel inclined to share this short with other, go nuts. Special thanks to the Durham, NC County Police Department. We are proud to announce that post production on F/11 and Be There has been completed and we are at final cut. We were very fortunate to have enlisted the renowned animator, Cable Hardin, to animate several sections of the film. The film score was written and performed by Natalie Prass and Eric Slick, and if you don't immediately recognize those two names, you should be looking them up directly after reading this. Natalie and Eric performed a score unlike anything I've heard in a documentary. Additional music was provided by Luke Norton, another phenomenal multi-instrumentalist. We are currently working hard on festivals and distribution. As soon as we have news on both fronts, we'll send out an update and let you know when and where you can see the film. David and I would like to send out our deepest, sincerest thanks to all of you for being part of this process and for your continued interest in this film. Burk's story is something completely unique to our time - and we are beyond excited to help share it with you. It's hard to believe that we started this journey eight months ago. Every documentary film starts out with a premise that invariably expands and grows as you get deeper and deeper into knowing your subject. In getting to know Burk, we have had the pleasure of getting to know his significant other, Janet Kagan over this period of time. They both opened up their home and their lives to us. Janet preferred to stay in the background, but was always a significant force in the process of our production. Jethro and I are both so appreciative of the efforts put forth by Burk and Janet to support and allow us to really focus on the creation of this film. In the process of documenting Burk, photographing members of the African American community in eastern North Carolina, we started to see the importance of what he was doing and by relation, what we were doing. Timing is an amazing thing if you are able to recognize that opportunities that are presented to you. It also happened that we were making this film during one of the most tumultuous times in our history with the presidential election and aftermath in its wake. We were also blown away by how much work Burk has in his archives that has not seen the light of day. After one session of documenting him going thru the archives, I asked him where the work that we had seen had been published. He responded that he had shot if for himself. Basically, hardly anyone had every seen these. I found out that this was the case for quite a bit of his work. It affirmed my belief in the significance of his contribution to the medium. I have no doubt that everyone who sees our film will feel the same way. We found ourselves back in Wilson, North Carolina after Burk had shared with us that he had connected with a group of former gang members that have entered a leadership program and are doing community work. One of the people, Theophilus Newkirk, was a late addition to the Greenville show. Shirtless, photographed from the back, against a wall with a portion of his 60 tattoos in evidence. What was not seen in that image was the 11 gunshot wounds that he received one night in January 2016 while visiting his father with his girlfriend, Lawanna and one of her friends, who also got shot 9 times that evening. The irony was that he was not even the ultimate target. The shooter, who Theophilus had known since he was a toddler was looking for a friend of Theophilus’ that he could not locate. Theophilus was generous enough to allow us to film him being photographed and to document his bullet wounds. Both he and Lawanna also shared much during interviews with us. Burk’s plan is to photograph many of the gang members and document their stories for his next series. "The highway is the enemy of photographers"
I was fortunate enough to witness the accuracy of that Burkism as we drove cross country from Asheville, NC to Salt Lake City, Utah over the course of 11 days. 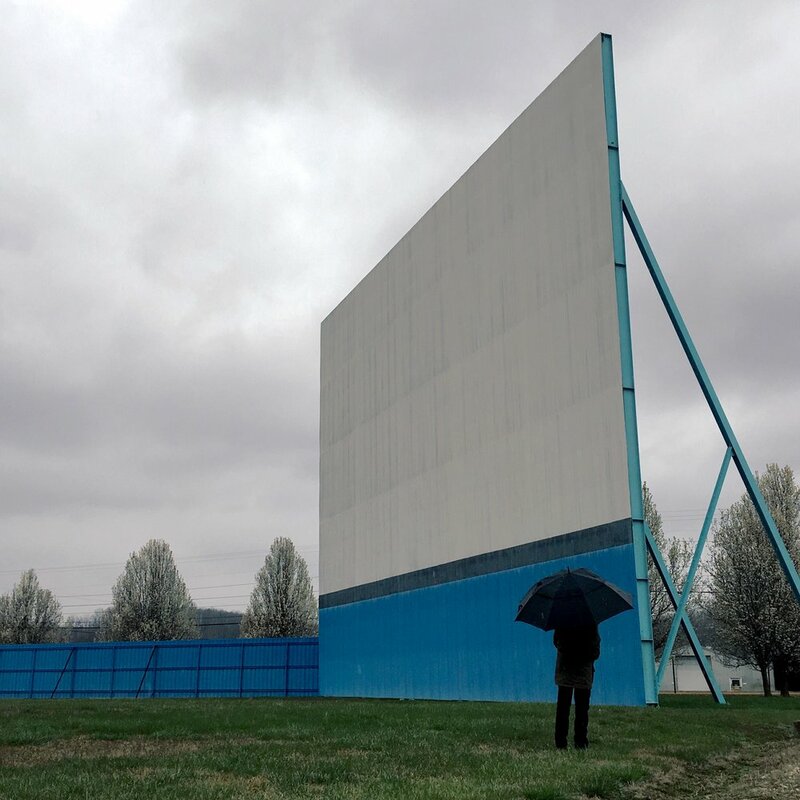 Getting purposefully lost on backroads through eastern NC, Tennessee, and Arkansas, we stumbled upon some true gems that Burk turned into wonderful photographs. I turned 36 in Zion, Utah. I cannot accurately express the joy of seeing Zion for the first time in combination with filming Burk doing what he does best - seeing an idea, walking out to the periphery of that idea, tilting the perspective on the ordinary, and pulling a beautiful composition together. The day after my birthday, we thought it would be good idea if I got strapped to the roof of Burk's van and filmed the drive through Zion Canyon. Both the footage and I surived, saving Burk from the dark task of explaining to an auditorium full of students and teachers that the film has been delayed indefintely due to the cinematographer having gone flipping off the roof rack and into the great wilderness beyond - his only visitors, the mountain goats who notice his broken body laying amongst their favorite balancing rocks. We visited the Waterford School in Salt Lake City at the end of the road trip. Burk had been invited as a visiting artist and lecturer for arts week. Bernie Meyers, the head of the photo deparment, is one of Burk's closest friends. The Waterford School is one of the finest examples of what is possible in Liberal Arts education that I've experienced. On February 3, 2017, the Greenville Museum of Art (http://gmoa.org) opened the exhibition, Perceptions and Recognitions; African-Americans of Eastern North Carolina. We had witnessed quite a bit of the process of preparing for this exhibition, from finding subjects to filming them being photographed. The gratification we felt seeing many of the images larger than life cannot be described. More so, the pride in each of the sitters faces was something to behold. The museum published a catalogue with the images. Many of the subjects were coming up to each other and getting autographs next to their pictures. It was like a scene from the last day of high school. People danced and shared. It was a very memorable evening. We were concerned that the museum would not be able to pull this show off in the short window of time that they had. Not only did they pull it off, it is something they should be proud of. We witnessed a community come together for an evening to celebrate itself thru the power of art. May this be a stone thrown into the water that has positive long reaching ripples. The show is up until April 30, 2017. If you find yourself in Eastern North Carolina in that window of time, don’t miss it. The day after the opening, we looked at a few books of vintage contact prints that Burk pulled for us. Needless to say, we were beyond blown away. From MLK Jrs. Funeral, Woodstock, protests, the KKK. We’ve reproduced a sampling for you to see. On February 8, we gave a presentation to the Asheville Art community about F/11 and Be There at Revolve (http://revolveavl.org) . We showed the trailer and some clips. Needless to say, people were excited about the film. Next month, Jethro and Burk take a road trip from North Carolina to Salt Lake City, Utah, where Burk is going to be teaching at the Waterford School. We hope that there will be some opportunities to film some roadside picture taking along the way. In the time since we began this film, the world has taken on a vastly different hue. And even if the light hasn't shifted dramatically from your window, at the very least, you might see the strange man there up on the light pole, about to screw in a wholly different kind of bulb. Things will look very different a year from now. And the parallels between the socio-political climate of today and much of the historical material we have been documenting in this film are striking.